The fibular or lateral collateral ligament (LCL) is a cord-like band and acts as the primary varus stabilizer of the knee. It is one of 4 critical ligaments involved in stabilizing the knee joint. At the proximal level this ligament is closely related to the joint capsule, without having direct contact, as it is separated by fat pad, The insertion is augmented by the iliotibial band. The popliteus tendon is deep to the LCL, seperating it from the lateral meniscus. The LCL further splits the biceps femoris into two parts. It is primary restraint to varus rotation from 0-30° of knee flexion. As the knee goes into flexion, the LCL loses its significance and influence as a varus-stabilizing structure. When the knee is extended, the LCL is stretched. The incidence of LCL injuries are relatively low (6%) when compared to other knee injuries. It is commonly associated with other knee ligament injuries, thus LCL tear can be easily overlooked as a result of that. In this position the iliotibial band relaxes and makes the LCL easier to isolate. The ligament lies laterally and posteriorly along the joint line. Ocassionally, the LCL is congenitally absent. When LCL is injured or torn, this cordlike band is not as noticeable as on the unaffected side. Purpose: The varus stress test shows a lateral joint line gap. Performance: A varus stress test is performed by stabilizing the femur and palpating the lateral joint line. The other hand provides a varus stress to the ankle. The test is performed at 0° and 20-30°, so the knee joint is in the closed packed position. The physiotherapist stabilize the knee with one hand, while the other hand adducts the ankle. Interpretation: If the knee joint adducts greater than normal (compared to the unaffected leg), the test is positive. This an indication of a LCL tear. Sensitivity: 25%. Specificity: not reported. Varus stress testing was performed in 20° of flexion, and testing in extension was not done. Sensitivity: 25% . The reliability of this test in extension is 68% and in 30° flexion only 56%. The test is fairly solid. If the varus stress test is positive at 20°, but negative at 0°, only the LCL is torn. A positive result at both 0° and 20° indicate cruciate ligament involvement. ↑ 1.0 1.1 LaPrade, R. F., Macalena, J. A. Fibular collateral ligament and the posterolateral corner. Insall & Scott Surgery of the Knee. 5th ed. Philadelphia, PA: Elsevier/Churchill Livingstone, 2012; 45: 592-607. ↑ Schünke M, Schulte E, Schumacher U. Prometheus deel 1: Algemene anatomie en bewegingsapparaat. Houten: Bohn Stafleu Van Loghum, 2005. ↑ Whiting WC, Zernicke RF. Biomechanics of musculoskeletal injury. 2nd ed. Human Kinetics, 2008. ↑ 4.0 4.1 4.2 Malagelada F, Vega J, Golano P, Beynnon B, Ertem F. Knee Anatomy and Biomechanics of the Knee. In: DeLee & Drez's Orthopaedic Sports Medicine. 4th ed. Elsevier Health Sciences, 2014. ↑ 5.0 5.1 Moore KL, Dalley AF, Agur AMR. Clinial oriented anatomy. Philadelphia: Wolters Kluwer, 2010. ↑ 6.0 6.1 Miller RH, Azar FM. 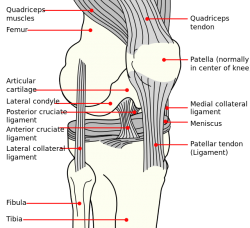 Knee injuries. In: Campbell's Operative Orthopaedics. 13th ed. Philadelphia: Elsevier, 2016; 2121-2297. ↑ Tandeter HB., Shvartzman, P. Acute knee injuries: use of decision rules for selective radiograph ordering. Am Fam Physician 1999; 60(9): 2599-2608. ↑ Kane PW et al. Increased Accuracy of Varus Stress Radiographs Versus Magnetic Resonance Imaging in Diagnosing Fibular Collateral Ligament Grade III Tears. Arthroscopy, 2018. ↑ Hoppenfeld S, Hutton R, Hugh T. Physical examination of the spine and extremities. 1st ed. New York: Appleton-Century-Crofts, 1976. ↑ 10.0 10.1 Petty NJ. Neuromusculoskeletal examination assessment: A handbook for therapists. 3rd edition. Edinburgh: Elsevier, 2006. ↑ Malanga GA, Andrus S, Nadler SF, McLean J. Physical examination of the knee: a review of the original test description and scientific validity of common orthopedic tests. Arch Phys Med Rehabil, 2003; 84(4): 592-603. ↑ Merriman L, Turner W. Assessment of the Lower Limb. 2nd ed. Churchill Livingstone, 2002. ↑ Walters J, editor. Orthopaedics - A guide for practitioners. 4th Edition. Cape Town: University of Cape Town, 2010.